For the second year running the British GP was held at Aintree and all the main teams were back in action after strikes had disrupted the appearance of Porsche at the Belgian GP and Ferrari at the French. The Italian team ran only one car for Phil Hill on this occasion. 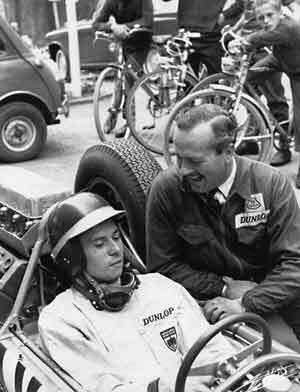 After qualifying Jim Clark was fastest in his Lotus and shared the front row of the grid with John Surtees's Reg Parnell Racing Lola and Innes Ireland in his British Racing Partnership Lotus. Bruce McLaren (Cooper) and Graham Hill (BRM) shared the second row while French GP winner Dan Gurney was on row three in his Porsche alongside his team mate Jo Bonnier and the second BRM of Ritchie Ginther. Ireland was out of luck on race day when his car failed to get off the line with a gearbox problem and that allowed Clark to get into the lead with Surtees, Gurney and McLaren chasing. Jack Brabham made a good start in his private Lotus to be ahead of Hill's BRM. Hill retook the position on the seventh lap but otherwise little changed in the early laps. Clark built up his lead with Surtees second while Gurney ran into clutch trouble and so dropped behind McLaren and later G Hill and Brabham. There was very little action for the rest of the afternoon and Clark won by nearly a minute.